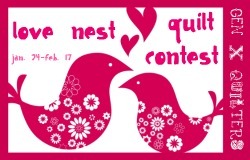 Spun Sugar Quilts: Love Nest Quilt Contest. Just wanted to clue you in on a new contest that started. It's called the Love Nest Quilt Contest. What a great idea to have a quilt show for modern bed sized quilts! It's hosted by my friend AnneMarie of Gen X Quilters. She's a fellow CMQG blogger. Check out her blog and the contest. I am going to be one of the judges! how exciting and tough that will be. Oh and there WILL be prizes too. Looks like there are already entries. Wish I could enter LOL.